Explore the back roads of Baja California and the national flavors of El Salvador with these two cookbooks by a local chef and a home cook. La Cocina is a series that highlights the best Latin American cookbooks from the South of the Rio Grande to the Strait of Magellan, with an emphasis on L.A. chefs and home cooks. 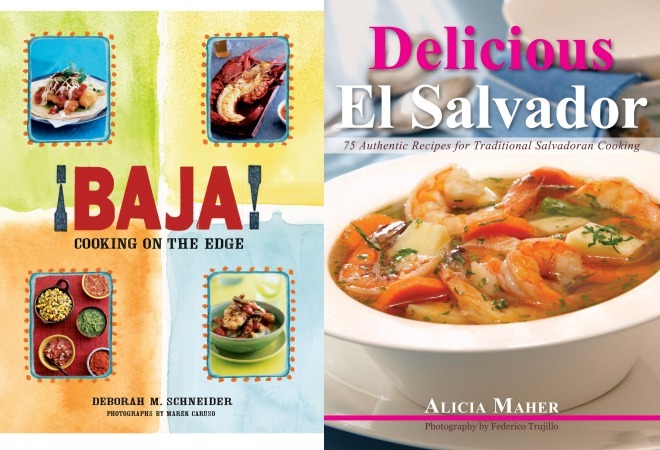 Two local cookbook authors have recently written important books for enthusiasts of the Latin American kitchen. The first is Baja Cooking on the Edge, 2nd Edition by chef and restaurateur Deborah M. Schneider ($48, hardcover) takes us back to the Baja California that was before the international press showed up. The second cookbook, Delicious El Salvador by Alicia Maher ($23), a Salvadoran home cook that has penned the first English language cookbook on Salvadoran cuisine. Both are both excellent additions to your bookcase that showcase regions of Latin America which are often under-represented. When Schneider wrote her first cookbook in 2006, Baja Cooking on the Edge, she was part of a small group of U.S. Citizens ( I was one of them) that took notice of Baja California’s rich cuisine, three years before the press began to focus on the state’s street food and Baja-Med cuisine. Schneider has excellent recipes for Baja traditions like Puerto Nuevo-style lobster, roadside grilled quail, and yes, Tijuana’s famous Caesar salad. She features the wine country cuisine that emerged from landmark restaurants such as Laja. There are solid recipes for street foods not usually listed in Mexican cookbooks such as a real al pastor marinade and fried fish tacos, including all the sides to transform your kitchen into a sunny afternoon in Ensenada. In Delicious El Salvador, Maher gives you a thorough course on Salvadoran cuisine—one of the strongest Latin cuisines represented in Los Angeles—with around 75 recipes in English. It’s the only book of its kind and one of only two Salvadoran cookbooks in print. Explore the savory stews and soups favored by Salvadorans like egg and chorizo soup, mariscada ( a seafood soup thickened with Salvadoran cream), or carne guisada, El Salvador’s own pot roast. Maher makes sure to include the fundamental preparations like salsa casera and salsa criolla–the two essential tomato sauces—and Salvadoran-style beans, rice dishes and tortillas that are served with many dishes. Yes, there are recipes for pupusas—don’t worry, that will keep you busy all summer long trying to hand-slap your way to a pupusa tasting.